Social media brings us together. It provides bridges, facilitates communication, gives us a way to defy time zones and social conventions. For the FASD community, it lets us find others who have insight and experience with the many ways different lives are affected when a fetus is exposed to alcohol before its first breath. Social media lets us speak. It helps us to learn more. In general, it is a useful tool for us all. But this holiday, social media has been inadequate in the face of the pain some among us feel. The young woman with Fetal Alcohol Syndrome who is struggling to overcome her own addictions but cannot find help. She keeps getting turned away from A&E departments and says she is not sure she can bear it anymore. I hear her pain. The mum who feels like “the worst mother ever” because her youngest with FASD had a massive meltdown and her older son without FASD didn’t get to have a “normal” Christmas. I hear her pain. I hear both of those boys’ pain. The mother who has to console her child after the grandmother yet again berates the child and the parent for allowing “bad behavior,” ignoring all the prep talks explaining the condition. I hear her pain. The young person with FASD whose stepmother refuses to let her dad come to see her on Christmas and whose brothers try to protect her from the stepmom’s rejection. I hear her pain. The adult with FASD who despite being a renowned advocate still faces rejection from his own family and friends. I hear his pain even as he helps others. The parents discussing at what point the earlier self-harm turns toward something more dangerous needing intervention. I hear their pain. The birth mum with FASD trying to break the cycle, but who is denied time with her own child more than a few visits each year. I really hear her pain. It stabs through me. The adults who struggled their whole lives and only received their diagnoses after some big crisis, a run-in with crime, jail time, a career or relationship that crashed and burned, who try to pick up and move forward. I hear their pain. There are many of these stories throughout the FASD social media. The reality is that our growing FASD community IS in pain. Help is needed urgently and desperately. Lives are at stake. Futures are in jeopardy. Right now. The statistics show that somewhere between 3-5% of the population has some sort of brain injury due to exposure to alcohol in the womb. These are our friends, our family, our neighbors – those kids in our schools who seem unable to focus, those who are easily led into trouble, lost. Those family members who always were “difficult,” who were forgetful and never on time. The teens with bad tempers who drank a lot or joked too much. They are among us, undiagnosed and struggling, feeling bad every day of their lives for some damage done to them before they even opened their eyes onto this world that lets them down again and again. And again. They are the ones who have diagnoses who try to do better but who lack support, advice, guidance, anchors. They are the children struggling with FASD, whose overwhelmed parents want to help but don’t know how, don’t have the tools, have run out of strength and have nowhere to turn while their kids escalate further in such tense environments. I hear the pain. It runs throughout this community. It can drown you, make you want to turn away. I fear some social media posts I have seen lately are counterproductive. Hyping the number of kids being adopted with FASD. News reports seemingly skewing data to make it seem like all kids with FASD have doomed outcomes despite parental input and early intervention. This combines with stories of many who have adopted kids with FASD who seemingly were totally unprepared for the difficult terrain. I worry that good-willed people are in danger of discouraging adoption of kids with FASD, vulnerable and innocent kids who are so in need of stable, accepting and informed families. The stories that need to be told are dramatic enough to focus our attention. There are people amongst us who have portions of their brains injured, destroyed or maybe even missing due to alcohol that coursed through their veins before they were ever able to cry out their pain. The damage done throughout their tiny, still forming bodies when alcohol burned its path into their developing systems, causing internal damage, structural problems. These graphic details are not polite conversation, but they are the root of the FASD community’s pain and the suffering of our children, young adults and adults who live on this spectrum. The distressing and disturbing behaviors and executive functioning difficulties are symptoms of hidden and serious physical disabilities. No, it has not been a happy holiday for many hundreds, maybe thousands of people in the UK whose lives are affected by an FASD. But this can change. What is really needed is an open and straightforward approach to addressing these issues. The UK has experts who can lead on these issues – they need resources, support and bigger megaphones. The new UK All-Party Parliamentary Group on FASD is beginning to form some thoughts on effective ways forward (this will be the subject of an upcoming blog post). There are increasing numbers of educators and health care professionals coming into contact with FASD for the first time, which means that the next time they will know a little bit more and do a little bit better. Our community is becoming more organized, even if it is still strangely disjointed domestically and out of step internationally. Most importantly, there are powerful voices rising – those adults with FASD whose courageous leadership offers greatest hope. People who are becoming savvy in using social media as a vehicle for change. And up in my own child’s room, do you know what I hear? The crashing has stopped, he has found his calm, in his own way. Lights off, he’s in total darkness except for one glowing and soft “mood pillow.” He has put on music and is rocking, having found his center. He is learning how to navigate his world, because we are learning. We are doing what we can to learn with professional help and advice from the FASD social media community. Together we are finding ways to empower him to understand himself and his needs. I hear his pain, still quietly internalized, but I hear his hope. I hear his song. I hear his tomorrow. That is all there too. In our lives and in the FASD social media. I hear about the small moments of joy, of triumph. I hear the cheers when big moments happen and people overcome. I hear the love and I hear the determination. It’s all there in social media. I try to respond positively to every bit of fresh air. My optimism needs that oxygen. I welcome the successes, every small step of the way, every time a child rises, every time a parent finds a way forward. Every smile. But that doesn’t mean I do not hear the rest. 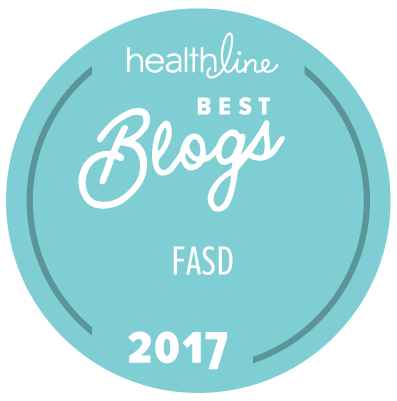 And this post, this post is for those affected by FASD who are struggling. I am sorry FASD is so cruel and society is deaf to the needs of this community. I am sorry for such pain. I hear you. I hope you are tied in with FASD support groups on Facebook, etc. It can feel lonely but there are many walking a similar path.